To those who closely follow trends that occur in Japan the talk of population decline will inevitably come up. As reported masterfully in this article, modern marriage has become increasingly unappealing. Traditionally, a man could find a good career to provide while his wife stayed at home to raise the children. Now that many women have greater access to the job market they are choosing to forego marriage altogether, which has created a steady decline in population. Given that a great majority of people in Japan are now engaged in a career, there exist few opportunities to form a “love marriage”. In the Western world a relationship formed upon love seems to be the primary motive for marriage. However in many Eastern countries, arranged marriages have historically been common practice. In Japan the concept is known as 'Omiai', that is, arranged marriage. It is becoming increasingly popular given the modern situation that many Japanese people find themselves in. With great emphasis placed upon economic success often times thoughts of a family become low priority. Traditionally, arranged marriages worked in local areas where people knew each other through family connections. Later the heads of the families determined marital arrangements that would best suite the long term goals of the family prosperity without considering the individual as much. Now families or individuals can hire a go between to connect interested parties. After viewing a database full of potential suitors each party must agree to meet up. They then meet successively and determine whether to further the process to marriage. If interest is determined the man will send gifts which include an engagement ring and money. 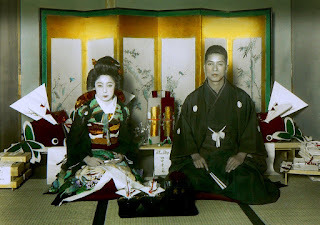 The interested parties will then typically get married in a Shinto ceremony. With the divorce rates in Japan a lot lower than in the United States it is hard to fault Omiai as a bad choice! Although it does have its dark side. We know a woman here who under much pressure from her family decided to go along with an Omiai only to have it end in an unfortunate divorce as well as increased mental issues from which she has not yet recovered. However for each sad story there are likely stories of success. Here in Japan with such a small percentage of Christians the practice of Omiai may not be out of the realm of possibility for some. Although personally, I think that large annual fellowships within denomination are a good way to meet people here in Japan. The most important element here for the Christian minority is to stay strong in their convictions not to marry a non-believer. Please pray that Japanese Christians would be able to remain strong in their commitments to the Lord.